Vanishing Constriants, and 'What Gives?" Since Inventor R2010 has been introduced, I sometimes see this bout of 'unexpected behavior' pop up. Have you ever created a sketch, watch the constraints seemingly place, but after completing the sketch, suddenly had your sketch move around again as if the constraints never existed? It's almost always caused by the inadvertent turning off of constraint persistence. Fixing it is really simple. Of course all you have to do is know where to look. See the attached video for a fix. This blog post is somewhat anecdotal, but also was the story of a lesson learned. By me. I'm working on updating my Interoperability class from the Autodesk Manufacturing Academy, and was looking for some broken files in either IGES or STEP format that I could use as examples of how to stitch bad data. First, I went to McMaster Carr. I remember using the 'big yellow book' in industry years ago. They had very few CAD downloads, and what they had was pretty ugly. It was exactly what I was looking for, bad CAD files! I had heard they'd improved their CAD files since those long past days. But how much could they really have improved it? So off I go to McMaster's website, confident that I'll find some sort of IGES file in a dreadful format. 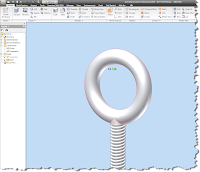 I quickly find an eyebolt with a CAD download button. They have several file types, most of which I can import. IGES is usually the one that gives me the most trouble, with STEP causing the occasional problem, so I try them both. The result makes my jaw drop. Both files import flawlessly. Even the troublesome IGES file stitches with minimal effort. One eyebolt. Imported in seconds! I try a couple more files. After all, this one has to be a fluke. Sure enough. Flawless victory. All the files I try are usable with little or no effort. Okay. I shake off the shock and go to plan 'B'. Carr Lane. I hated their site back in the day. Surely their content is still awful! 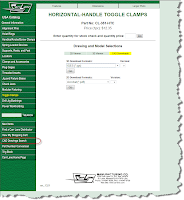 They have a page that lets you search for CAD files by part number. I download a couple of STEP and IGES files from them. How about a toggle clamp, Scarecrow? All but one IGES file are just like McMaster Carr's. Perfect import. Imported, not a single hitch! The one 'bad part' was an IGES file that wouldn't stitch because of bad surfaces in the Carr Lane logo. Unfortunately, it was such a mess that it would have taken way too long to fix. But I'll give Carr Lane credit where they deserve it. The step version of this file was another perfect import. If I was using this in the real world, I'd have used that format instead. That's one of the reasons multiple formats are available. So I don't feel I can fairly ding them for that. So what's the moral of my little story? There's actually two. One: Vendors providing 3D files is becoming more and more common all the time. Vendors see that there's value in it, and that's good for the designers out there. If you plan on using the part from a vendor, check their site before you build your own version. They may already have a model of that component available for download. Save yourself the work! Two: Websites change and get updated. I used to poke fun at the Carr Lane website to the point where I'm sure some poor content developers ears burned incessantly. But I have take my mockery of their site and put it in the archives now. While nobody from Carr Lane called me. they along with companies like McMaster Carr, have obviously been listening to their customers, and forced me to eat a little crow. The websites are vastly improved over what they've been in the past. Learn from my mistakes. Just because the site was underwhelming the first time you checked, doesn't mean it hasn't gone through some improvements since them. Give them a double check from time to time, and ask around. Things change, and you might be missing something! I spent a big part of my weekend fighting a cold, so I wasn't feeling up to blogging (why is it we get sick on the WEEKEND?!?). But, here's a video I created for the KETIV Tech Tips section on the KETIV website. Check it out here. I hope you enjoy it! And look for me at the AUGI CAD Camp in San Diego! I get to attend this year, and I'm really excited about it! Final thoughts are so, you know, final. Let's call them closing words. Yesterday, the 2010 the Pacific Design and Manufacturing show drew to a close. The show was good, but I w0uld definitely say that, I felt a different 'vibe' this year. At least that's my humble opinion. In 2008, everything was good. The economy was growing, and everyone was riding the crest of the wave. In 2009, the economy was slumping, and it seeme, everyone attending the show looked like they'd had to put their favorite pet to sleep that morning. It was more than a little disheartening. Now in 2010, the energy appears to be coming back a bit. Granted, it wasn't at the 2008 levels, but it was better. Everyone seemed more upbeat and things were happening again. Hopefully, these are signs of things to come! Traffic at the Autodesk booth was solid. There was a lot of interest, I know that I answered a lot of questions on Autodesk Showcase, Autodesk Inventor, Autodesk Labs, and my 3DConnexion Space Pilot. 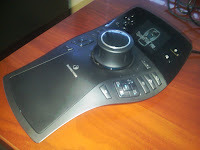 My SpacePilot Pro. Autodesk was giving one away! As for the cool stuff. It's always hard to run around at the show, simply because of my responsibilities at the Autodesk booth. 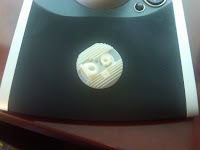 But I've always been a fan of the Rapid Prototyping companies, since the technology flat out amazes me. I used to work for a company that had one. It still fascinates me. Objet and Purple Platypus (the local Objet reseller) were there, showing their tech. It amazes me that the tolerances on these machines are getting down into the fourth decimal now. Back when I was in industry, our old SLA machine could only get to about .005 inches on a really good day! Quickparts was there, just like they have been for the last 5 years I've been going myself. This is a service bureau I wish I'd known about when I was in industry! Not only can they make rapid prototyped parts, they can do it with a ton of different processes too! I didn't get a chance to snap a picture of the booth, but they did give me a cool Rubik's cube, good for one trip down 80's memory lane! 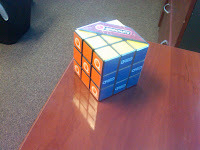 I never could solve these things. 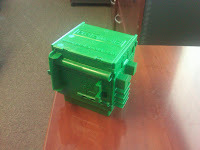 Finally, I spoke with the team at Protomold, who specialize in quickly creating short run molds and machine parts. I got the cool 'box' I call it. It's a clever little plastic box that shows some common good and not-so-good practices with creating plastic parts. You can request one from the Protomold website. Those are the highlights, at least for now! The show was fun, educational, and a little tiring too. I'll definitely be catching up on some sleep this weekend! The good news, I was able to get some material put together. The bad news. I found out I had the wrong data set for my presentation tomorrow. So, I'm cramming the new data set, and reliving my college days. Trust me. The memories of those late nights in school are way better than the reality today. But I didn't want to leave blog-o-sphere short of an update. Here's a video I shot of some of the Fanuc robots doing their thing. Sorry, the video is raw, so you'll have to forgive the people walking in front of the camera. I'm afraid I didn't get a chance to edit them! In any case. Here it is! More to come tomorrow, if I'm not prepping something else! Tomorrow I head off to walk the Pacific Design and Manufacturing Show in Anaheim. I've decided to try a couple of new things this year. I've linked my Twitter account to my blog (see the bottom of the page), and I'm going to carry my trusty Blackberry (for mobile updates) and my aging Kodak digital camera. My plan is to post some mobile updates from the show. It's a new thing for me, so we'll see how it goes. Ideally, look for some updates as I check out some cool tech tomrrow! I'm definitely hoping for the first result. Wednesday and Thurday, you'll find me working the Autodesk team at the booth. If you get a chance and find yourself at the show. Swing by booth and say 3609 hi! As promised. 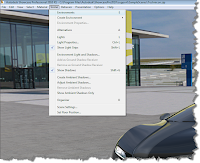 Here's part 2 of creating an environment inside of Autodesk Showcase. What's the biggest lesson I've learned so far? There's a TON still left to learn! But that doesn't mean I can't share what I've learned so far. So in the last Showcase blog post, I talked about where to get environments. Now, what to do once we have them. So first, I've downloaded a *.hdr image from the Alias Design website. In this case, I've grabbed the 'Daylit Gypsumcrater' *file. You'll find them in 'Environments' under the 'Downloads section. Once downloaded, now we switch gears and jump into Showcase. First, we get our scene open. But, today it's about creating a new environment, so now, we have to go to the 'Scene' pulldown, and activate our Environments menu. Showcase will ask you if this is a Backplate Environment(a flat environment) or a Geometric Environment (a 3D Environment). In this case, I'm using a Geometric Environment. What Type of Environment do we want? Now, we bring in our *.hdr file. Shown in the screen capture below. Now we can finally adjust our Environment. There's a lot going on here, and yes, I'm definitely still learning a lot here myself. I can say that I've adjusted exposure most often, since this adjust how bright an environment will appear. If your not sure, just take the defaults go from there. You can always go back and adjust! The Help button is definitely your friend for reference. I'll definitely post more tricks as I learn. Once you've made your adjustments, hit create, and Showcase will crank for a bit as it creates the environment. So these are the steps to create the environment. You'll even notice the new button (named 'Generic' by default) attached to the environments tree. Of course, there's a good chance you may want to go back and make adjustments. In this case, right click on the newly created environment and choose properties. There's a lot going in here as well, so for this part, I've shown two common areas that I change. First, is the name. The second, is the shape of the dome. 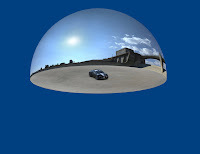 The dome shape can affect the look of the environment. I definitely suggest trying different dome shapes to get the best one. This will vary based on how the *.hdr file is used. Even MORE Adjustments You Can Make! One last note. Right click on the new environment, and you can save it to your library. This makes it available for future scenes, and saves you the trouble of having to repeat these steps unnecessarily! Time to Save This For Later! Whew! There's a lot going on, and I didn't go into all the details. But it's definitely a start. And as I start learning more, I'll start posting the tricks! As for what's next? 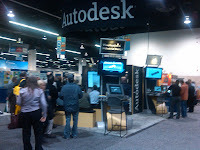 I'll be at the Pacific Design and Manufacturing Show in Anaheim next week helping out at the Autodesk booth. So if you're at the show, come by booth 3609 and say hi! If you've been paying attention, I've not been as good about Sunday night blogging. This week is no exception. I spent my Saturday at Planes of Fame being a volunteer museum guide. 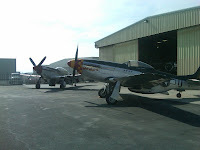 Planes of Fame's two P-51 Mustangs. They both flew Saturday. There's nothing quite like the sound of a Merlin engine purring. 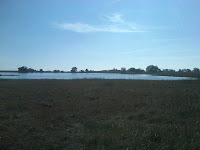 Sunday, I hiked to the vernal pools in Murrieta, which only fill with water during the rains. Unfortunately, due to teh conditions, we couldn't get much closer. Needless to say, Sunday night, I was more about an early bedtime then a blog post. But, at last, here we go! Today, I'm going to talk about environments in Autodesk Showcase. Environments in Showcase are something I've not worked with for one reason and one reason only. I've never gotten around to it. (I say this with a sheepish grin). But twice last week, I was asked by two different users where to find environments, and how to bring them in. Granted, this isn't the first time it's come up. But I finally told myself that I was going to take the opportunity to blog this information. So first of all, what is an environment? An environment is, essentially, the scenery behind your model. For example, if the P-51s in the picture above were the models I was showing, the hangar and airfield could be considered my environment. The environment is made of a High Dynamic Range image (HDR), which can be either flat (called a backplate) or three dimensional (such as cylindrical or spherical). 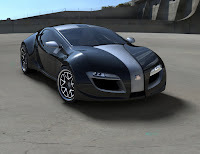 An example of the same car, showing the extents of it's environment. So now that we know WHAT an environment is, where can I get some. There are some that are included with Showcase, and those can get you pretty far, but you also may reach a point where you'd like a few more options. One thing is for sure, I don't have the complete, definitive list. But here's some places that I've either had recommended to me, or I've used personally. Alias Design - Registration is free, and they have a nice selection of free environments that you can download. The environments are also free. HDR Mill - They have a small free sample section, and you can purchase images from HDR Mill at fairly reasonable prices. I've used them before, and liked the results. If I was in the market for some new environments, I'd definitely consider them. Dosch Design - One big disclaimer, I've not used this personally, so I don't feel I can truly recommend them. At about $150 USD for around 30 images. They're a bit rich for my blood, since I just haven't run into a place where I need that many environments. But that being said. I have seen them recommended consistently by several users, and several sites. So I went ahead and gave them a shout out. With that being said, should I want to have an arsenal of environments at my disposal, I would be willing to try them, based on the recommendations I've received. So there's where to get some environments. Importing them into Showcase is not that difficult, but there are always tricks. Don't worry, I'm not going to abandon you. My next post will be taking an environment, and importing it into Showcase. But for now, back to my Monday!